The English artist Francis Bacon was one of the most powerful and original figure painters in the twentieth century. He was particularly noted for the obsessive intensity of his work. 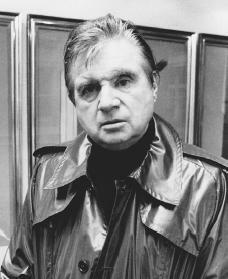 Francis Bacon was born in Dublin, Ireland, on October 28, 1909, to English parents. Raised with three siblings, Francis Bacon is a descendant of the sixteenth-century statesman and essayist of the same name. He left home at the age of sixteen and spent two years in Berlin, Germany, and Paris, France. In Paris he saw an art exhibit by the painter Pablo Picasso (1881–1973). Though he had never taken an art class, Bacon began painting with watercolors. He then settled in London, England, with the intention of establishing himself as an interior decorator and furniture designer. However, he soon turned to painting exclusively. Bacon began oil painting in 1929. The few early paintings that survive (he destroyed most of them) show that he began as a late cubist (a twentieth-century movement that used geometric shapes). By 1932 he turned to a form of surrealism (using fantastic imagery of the subconscious) based partly on Pablo Picasso's works from about 1925 to 1928. Bacon began to draw attention in 1933 with his work Crucifixion, and the same year he took part in exhibitions in London. Bacon exhibited very rarely until 1945. It was only after World War II (1939–45; a war in which British, French, Soviet, and U.S. forces fought against Germany, Italy, and Japan) that his paintings became known outside his immediate circle of friends. At this time he also began to paint the human figure. The pictures that made his reputation are of such subjects as a melting head in front of a curtain and a screaming figure crouching under an umbrella. These extremely original works are impressive not only as powerful expressions of pain, but also for the magnificence of their presentation and professional quality. By the early 1950s Bacon had developed a more direct treatment of the human figure, working almost always from photographs rather than from real life. Images taken from newspaper clippings or from the photographs of humans and animals by the nineteenth-century photographer Eadweard Muybridge were sometimes combined with images from the well-recognized paintings of the old masters. For instance, a series of paintings inspired by the portrait of Pope Innocent X by the Spanish painter Diego Velázquez (1599–1660) also uses a screaming face and eyeglasses that came from a close-up of a wounded nurse in Sergei Eisenstein's film The Battleship Potemkin. Such a combination of images drawn from completely unrelated sources is characteristic of Bacon's work. From the 1950s through the end of Bacon's painting career and life in the early 1990s, the consistent theme of his work was the isolation and pain of the individual, with a single figure (usually male) seated or standing in a small, windowless interior, as if confined in a private hell. His subjects were artists, friends, lovers, and even himself. His painting technique consisted of using rags, his hands, and dust along with paint and brush. Bacon consistently denied that his paintings were used to explain his own life. The facts of his life, however, have tempted art critics and historians to draw links between his personal life and the subject matter of his paintings. One of the great tragedies of his life was the death of his longtime lover George Dyer, who apparently killed himself. Dyer's death occurred just before the opening of Bacon's major retrospective (a collection of the artist's work) in Paris, France, in 1971. Bacon's famous and moving Triptych (1973) was a three-paneled work of his dying friend hunched over a toilet, shadowed in a door frame and vomiting into a sink. In a period dominated by abstract art, Bacon stood out as one of the few great representatives of the figure-painting tradition. During the last decade of his life major retrospective exhibitions were mounted at such sites as the Marlborough Gallery in New York, New York, in 1984, Moscow, Russia, in 1989, and the Museum of Modern Art in New York City in 1990. Bacon died of heart failure in Madrid, Spain, on April 28, 1992. The year 1999 saw the release of the book Francis Bacon: A Retrospective, which analyzed the work of the artist. The book coincided with a national tour of many of Bacon's paintings. Farson, Daniel. The Gilded Gutter Life of Francis Bacon. New York: Pantheon Books, 1994. Peppiatt, Michael. Francis Bacon: Anatomy of an Enigma. New York: Farrar, Straus, and Giroux, 1997. Schmied, Wieland. Francis Bacon: Commitment and Conflict. Munich: Prestel, 1996.